Our lives are surrounded by interesting, weird and strange myths! Unfortunately, the newborn baby is also not exceptional to these absurd myths. Regrettably, many could differentiate the myths about baby growth and the facts or even the advice! Where ever a new baby is born, elders, relatives and neighbors show themselves as expert in parenting and supply you with loads of parenting advice. Yet, many of these well-built parenting advices are merely the baby myths! While a few myths make no harm, myths surrounding the baby growth can harm the development and even turns fatal! Would you not love to learn myths about baby growth? The number one myth about baby growth and development is how the baby looks! Well, we all cute and fat babies, but not all fat babies are healthy. The heavy body of babies can be childhood obesity. Similarly, a slim or thin baby doesn’t always mean they are unhealthy and lacks nutrition. Babies eating lesser quantity of food may look fatty and vice versa. It is one of the absurd myths passed by our grandparents. Without proper vaccination, the baby’s health is open to loads of long time diseases and disorders. Even the medical researches’ have proven the fact that vaccinations have no apparent and even indirect effect to cause autism. This is half true. Watching television cause delayed speech and this is proven medically. Yet this is not applicable for all babies. Delayed speech can be due to various reasons. So, you should concern for this issue with utmost care. Your baby may look exactly like you or your spouse or your parent or the sibling! Yet, there is no proven fact that the habits resemble the same! Inheritance of physical features does not impact the behavior! For instance, if your baby girl resembles you, it might have inherited the habits from her father. 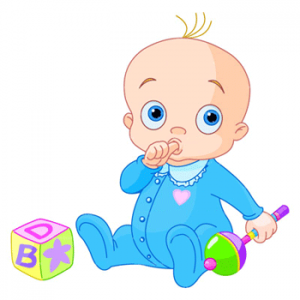 Your baby may be an active one extrovert or a silent kid, introvert; it all depends upon the atmosphere the baby live in. Your first baby can be an extrovert and the youngest one can be the introvert kid! Again it is a true myth with no proven facts. While a few physical features, other than the color, facial looks, hair, etc are inherited by the baby, there are few features like height and weight, overall health of a newborn etc are influenced by the health of mom who delivered the baby. If your baby is too short as a newborn, you should not come into a conclusion that it will not grow taller and vice versa. Height of the baby at birth is not the indicator of the adult’s height. OTC drugs are not for kids! In fact the medicines need a few days, at least a couple of days to be absorbed in the body and help the baby recover. Child’s brain develops in a rapid pace until 5 years of age. It is the phase where the babies learn everything! Whatever your baby learn until 5 years, it will be remembered for ever. So, you can speak multiple languages to your baby, which has a great grasping power. It is true that nothing could beat the nutritious value of mother’s milk and so the breast fed babies are the healthiest ones. Yet there is a myth that these babies are not intelligence. Whether it is breast milk or formula milk, intelligence of babies has no relevance.